Supplier & Distributor of Industrial Chain Conveyor. Our product range also comprises of Coal Handling Plant, Food handling Conveyors and Roller Conveyor. We are looking inquiries majorly from specific regions like South Africa, Middle east, Far East Asia. Industrial Chain Conveyer are made with superior quality stainless steel and highly appreciated by our clients. We manufacture and supply chain conveyor to our valuable clients at reasonable price. These conveyers are used for transporting materials from one place to another. These conveyers are installed easily and provide easy operations. These conveyers are used in different industrial applications. 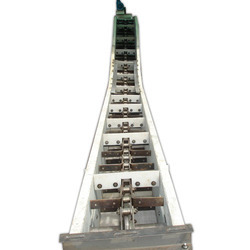 Looking for Industrial Chain Conveyor ?